La Villa Parmigiano Reggiano for sale. Buy online at Zingerman's Mail Order. Gourmet Gifts. Food Gifts. 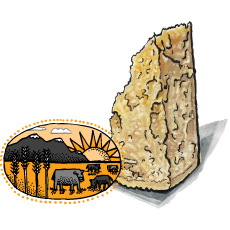 Organic farmstead cheese from south of Parma. La Villa is a beautiful mountain farm owned and run by the Carburri and the Folezzani families. Everything about the farm is organic. They grow all the crops which turn into feed for the cows and they mill their own grains every day for the herd. Eating the grains so close to milling mans less oxidation and more flavor for the cows, which in turn leads to better milk quality. These lucky cows also get plenty of time grazing on open pastures (one of the few Parmigiano Reggiano producers that let their cows out in the field). The yeild on their milk is small, but very high quality which results in a small amount of exclusive, extremely good cheese. The flavor is bright, more buttery than others, perhaps with a bit more moisture and a hint of an almost gouda-like character. Every wheel they make is already sold, so convincing the creamery to let us snag a few precious wheels was a real coup. Grab your wedge before they disappear. The wheels we're currently cutting into are the butteriest parms we've (probably) ever tasted with bright, near citrus flavors and subtle lingering notes.